I love carrots, they are simple to make and they taste so good. 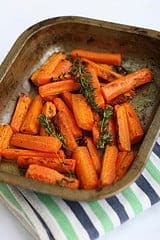 During the winter I love to prepare roasted carrots, cooking in the oven seems to warm up the kitchen and this side dish practically cooks itself. If you are ever looking to stretch out your food budget I find carrots a great way to make an inexpensive side dish. They are simple to work with you simply need to peel and chop them and we are ready to go. These are also one of the least expensive organic vegetables I think you can find. I often find these for for a great deal at Costco. In fact if I am roasting carrots I want the larger carrots which are often less desirable because they are so big. When you roast carrots they shrink a lot. If you can’t find the large carrots you may want to leave them whole when you roast them. I am preparing this recipe with coconut oil, you don’t have to use coconut oil, you can use the vegetable oil you prefer. You could even use butter. 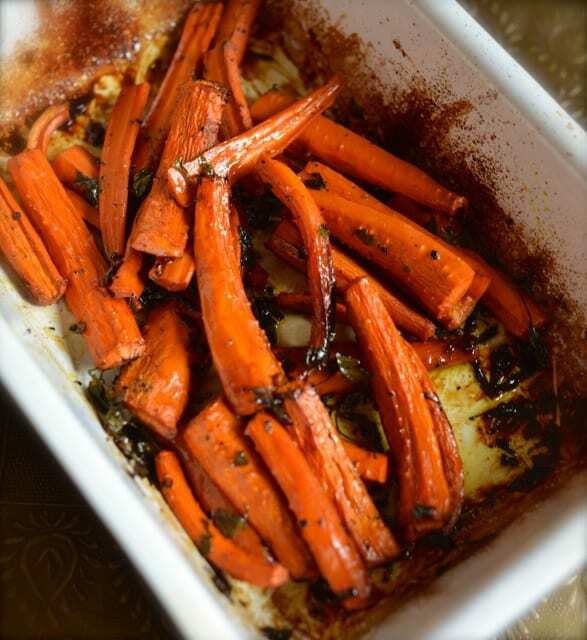 I have on a coconut oil kick lately, so I am making these roasted carrots with coconut oil. So let’s get started. Honey roasted carrots are so easy to make. Enjoy this inexpensive vegetarian side dish for dinner. If the carrots are thick, cut them in half lengthwise; if not, leave whole. Slice the carrots into 3 to 4 inch pieces. In a bowl combine coconut oil, cider vinegar, and honey, whisk together until you have a uniform mixture. Place carrots into bowl and coat with cider, honey, and oil blend. Place coated carrots in a baking dish. Sprinkle salt and pepper over carrots. Bake carrots at 350 for 30 minutes. These are the best carrots.